Love these dishes. They are nice and heavy and feel good in your hand. I love the neutral color, but they are not boring! The large mugs are perfect for morning coffee or tea. Many sets come with tiny mugs, but these are a nice size. Certified International's "Artisan" by Karidesign features durable stoneware dinnerware and serveware with a hand thrown pottery feeling. The simple white glaze and splatter complement the beautiful natural clay color. 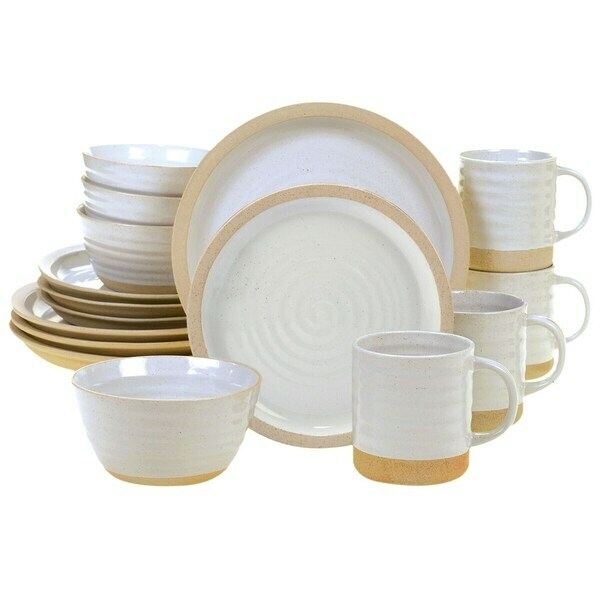 These neutral colors follow the latest trend for simple crockery and go with any decor. Dimensions 10.75 In. X 10.75 In. X 1.0 In. This is a wonderful set!!!! For the price, you cannot beat it! I was looking for a natural clay looking set, but they’re so expensive! One plate handmade costs as much as this set. I couldn’t be happier. I really love the deep dish style plates also to hold gravies better. Also, I was weary about buying bc the trim looks gold in pic, but it actually a grey is clay color! It’s exactly what I wanted!!!! I like them but...there are some imperfections which you would expect with Artisan" pottery. They are rougher on the bottom than I expected, you have-not be careful not to drag them on on the counter or your table. Also one of our dinner plates came with a chip on the edge. Easy to fit most decorating styles with its neutral colors. All of the dishes are ample and have a nice weight to them. I was surprised that they are not oven safe. They are definitely a set to beware when washing - they chip easily. It's rustic and beautiful. I love pottery. "Where are the serving pieces to this set?" Set includes: Four (4) dinner plates, four (4) dessert plates, four (4) mugs and four (4) ice cream bowls.